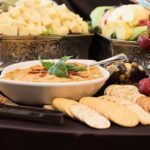 Discover a wonderful mix of traditional and contemporary Mediterranean menu items, including a wide variety of vegetarian, vegan, and gluten-free options. Since 1977, we have proudly offered our guests flavorful, gourmet quality dishes at an affordable price, made fresh each day from our family’s personal recipes. We believe that healthy, honest food has soul so it not only tastes good and is good for your body, but it makes you feel good too! Come join us and see why Neomonde was voted the #1 restaurant in the Triangle by diners on TripAdvisor.